Even after playing a tough, physical game that was nearly perfect at times, Oregon found a way to lose to a shocked Stanford team that was dominated nearly the whole game, except at crucial times when the Ducks mentally and physically collapsed. The result was a 38-31 overtime victory for the Cardinal, who was lucky to get out Eugene alive. A bad center snap that cost the Ducks a possible touchdown and gave Stanford an easy 80-yard touchdown, allowing them to cut Oregon’s lead to 24-14 instead of 31-7, was the first major gaffe. The second snafu was Coach Mario Cristobal’s decision to go for a first down, resting second-and-two from the Cardinal 42-yard line and 51 seconds left in the game holding a 31-28 lead. A freshman running back fumbled and Stanford recovered, driving to the Duck 28-yard line where they kicked a tying field goal with no time left on the clock. Cristobal said after the game that he wanted the offense to be aggressive and close out the game with a first down. Only problem was that it was no longer necessary to be aggressive and the safer play was conservative: have quarterback Justin Herbert kneel down, using up the Cardinal’s last time out. On third down, the Ducks could run the play clock down to 15-20 seconds. Oregon could have punted out of bounds and Stanford could run one desperate play from deep in its own territory with no chance to stop the clock. Although the Cardinal blocked this play very well for running back Bryce Love, you can see the good pad level of the Duck defense. Stanford does a nice job of kicking Troy Dye (35) out of the running lane, but could not sustain this effective blocking the rest of the game as the Duck defense won the battle in the trenches. Many have criticized defensive coaches for relying on middle linebacker Kaulana Apelu (39), undersized for his position at 5’10, 208 pounds, but here he shows critics what he does best — goes downhill (through a defensive gap) after using his hands to get rid of a bigger, stronger (but not smarter) offensive tackle. Although outweighed by the player attempting to block him by over 100 pounds, Apelu makes a hard tackle on Love. Quarterback Herbert shows his speed and athleticism on this read option play. The Cardinal have seven defenders against five offensive linemen and Herbert reads the outside defender to his left crashing down inside to tackle Tony Brooks-James, who doesn’t have the ball. The Ducks have three wide receivers to the left and if they had completed their blocks, the tight end outside the left tackle could have turned inside to block out the free safety, leaving Herbert with nothing but green AstroTurf between him and a touchdown. Brooks-James gets the ball on the handoff and with freshman offensive left tackle Penei Sewell and left guard Shane Lemieux obliterating Stanford’s right side defense, Brooks-James practically walks in for Oregon’s first score. 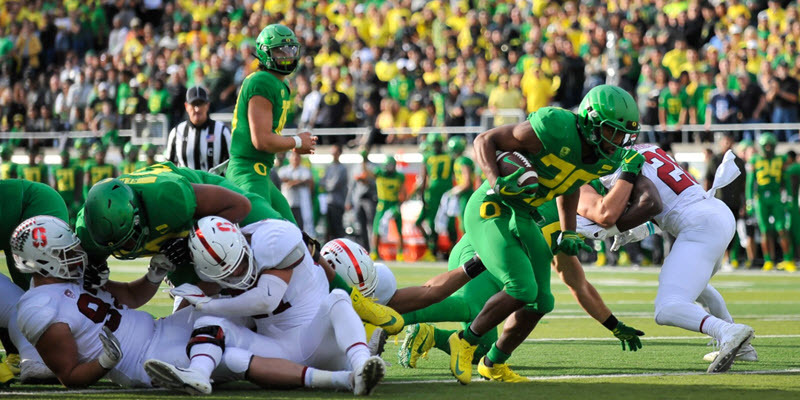 This play was an example of many that showed the Ducks’ offensive line blocking the physical style of play that Cristobal is instilling in Oregon’s football culture. Apelu once again makes a slashing tackle, but it is all set up by the penetration of nose guard Jordon Scott (34) who gets by two offensive linemen whose pad levels are too high and their athleticism too slow to stop Scott. This is an example of a great nose guard who cannot be single-blocked. In this case, Scott can’t be double teamed, either, and he sets up Apelu with an open lane to make the tackle. Like the nose guard who doesn’t get a lot of love in individual stats, a defensive end (Jalen Jelks, 97) doing his job setting the edge of the defense on his right side, loses a chance for stats by causing two Stanford blockers to unsuccessfully move him out of his gap responsibility and afford Love room to run outside. Jelks, with lower pad level and a wide base, has leverage to make it a stalemate, force Love to cut back inside to tacklers who might not have made the tackle if Jelks didn’t set the edge properly. This is an excellent example of the leveraged defense that Defensive Line Coach Joe Salave’a has molded this season; also exemplifying the player’s disciplined, unselfish attitudes that are so important in playing good defense. In this video, you see another example of the fabulous blocking the Duck offensive line put on the Cardinal defense. Running a play that Stanford likes to run, the Ducks pull several linemen who perfectly block the Cardinal defense. Lemieux (68) kicks out an edge defender, and the rest of the front seven are blocked by Ducks, all of whom have leverage with lower pad levels and better footwork. The teamwork between the pulling linemen and running back CJ Verdell is excellent and all he has to do is beat the free safety that takes a bad angle to tackle him. All the great plays a team makes can be undone by coaching decisions that prevent players from being in a situation to be successful. Cristobal’s decision to run the ball on second-and-two turned out to be a wrong one. Doing things the easy way sometimes is the best way to go. Pounding your chest and being aggressive is the way to go most of the time, but not this time. Even Alabama would have made Stanford burn their last time out; this would have put the Ducks in excellent position to win a game, that until that play, they had deserved to win. The videos show great execution by both the offensive and defensive line that Oregon demonstrated all day. With continued great play by Herbert, the Ducks showed, in defeat, that they can play with anybody in the Pac-12. Now they must play more disciplined and smarter so the breaks, and victory will come their way. This includes the coaches, who still have to improve on a poor pass defense and better decision-making.